Speeding in the legal sense of the word refers to driving at a speed above the posted speed limit, driving too fast under harsh road conditions, or racing. It is a risky driving behavior of which we have all been guilty. In the state of Washington, a total of 20,601 collisions were speed related in 2011. In that same year, there were a total of 10,001 fatalities across the US as a result of speed related vehicle collisions. Because of the risks involved, speeding tickets are typically hefty fines that aim to curb such behavior. Unfortunately, speeding tickets are sometimes issued unfairly and can be tricky to defend against. That's why you may want to contact an experienced Mount Vernon speeding ticket lawyer as soon as possible. You can submit your speeding ticket online using the PickIT-4UR-Ticket app by simply clicking the button on the mytrafficman.net homepage that says FIGHT YOUR TICKET to receive immediate legal help from one of the experienced Mount Vernon speeding ticket attorneys in our alliance of top caliber lawyers. When a driver receives a ticket for speeding, his fines depend on the speed limit. The general, or basic speed law in Washington claims that “no person shall drive a vehicle at a speed greater than is reasonable and prudent under the conditions and having regard to the actual and potential hazards then existing.” WA § 46.61.400(1) and (3). More specifically, Washington State observes the absolute speed limit law. You could attack the officer’s methods of determining your speed. Find out what device he used to estimate your speed and then find fault with that device or method. The officers speeding or traffic violation report may be missing important elements. 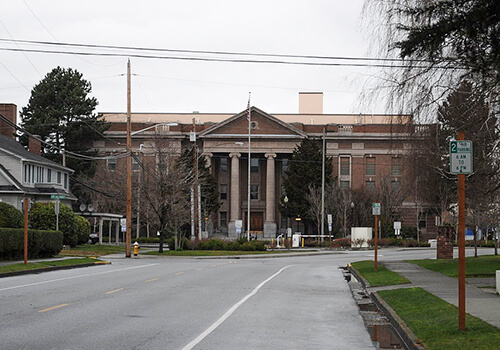 Officers don't usually appear at a traffic ticket hearing in Mount Vernon, WA, and instead just submit a written report that may have defects or insufficiencies. These could lead to getting your ticket dismissed. Not only do you have 15 days to hire a speeding ticket lawyer and respond to the traffic ticket, but police only have 5 court days to file the ticket. Important deadlines can create yet a third way to beat your ticket. If you are ticketed for exceeding the posted speed limit, or for driving faster than is deemed safe based on the specific driving conditions present at the time, give our Mount Vernon speeding ticket attorneys a call to schedule a free in-depth consultation, or click here to chat online with an attorney right now. With a network of attorney offices in Bellingham, Skagit County, Bellevue, and Vancouver, Washington, MyTrafficMan is a link to a select alliance of top caliber lawyers for Legal Care in DUI, criminal defense, car accident claims, and speeding ticket violations. Call us at (360) 734-0908 now.